Thank you for the faith focus of your summer 2016 issue. 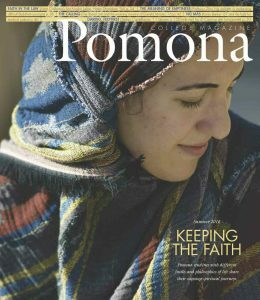 It is good to know that, just as in my day, people of faith are being helped by their Pomona education to deepen and integrate their received religious heritages into modern worldviews that will enable them to live creative and fruitful lives. I do wish, however that the fine interview of Judge Halim Dhanidina had touched upon how his faith as an Ismaili Muslim has served him as a foundation for his commitment to providing equitable justice in these United States. I just wanted to let you know how much I enjoyed the summer issue. I was a religious studies major at Pomona (featured once myself when I brought a group of Tibetan monks to campus to create a sand mandala), and it was so much fun to read about students and their personal, spiritual and academic journeys. I particularly enjoyed reading about the young man in “The Calling”; he was very inspiring. Now I’m a practicing ob/gyn in a low-resource setting, and the “No Más” article also hit close to home. Well done; I really enjoyed it. It is such an honor to have TWO letters from the Class of 1962 in the newest Pomona College Magazine’s “Letter Box” pages. You’ve made my classmates and me very happy. However, there must have been some sort of glitch in the printing of the magazines sent to the 95120 zip code in San Jose, California. Pages 25 through 40 were missing from the center of the magazine. My San Jose friend from the Class of 1966 showed me her magazine, and it has the very same problems. On the Class of 1962 listserv I asked my classmates if anyone else was missing magazine pages. Those who replied said that their magazines were fine. One of them, who had finished reading the magazine, mailed it to me, and I will share it with my San Jose friend. It has all of the correct pages and no duplicates. The gorgeous two-page photo of the Pomona Glee Club singing at St. Peter’s in Rome—It bowled me over. The photo of that “youngster,” Deborah Bial, founder of the Posse Foundation—I looked her up. Since 1989 she has identified promising students from urban backgrounds using alternative standards for predicting their success in college. The students are provided with extra support, and the program has an excellent graduation rate. In 2007 she won the MacArthur “genius” grant. In 2010 Barack Obama gave his Nobel Prize money to 10 charities, and the Posse Foundation was one of the 10. The interview with Ashlee Vance, author of a book on Elon Musk—I found the book on Amazon and read several pages. Mr. Vance is a somewhat casual writer, but his stories held my interest. Elon Musk’s Tesla factory is just up the road from my San Jose house. Ordinarily, only customers who have purchased a Tesla can tour the factory, but a friend was able to get our group in. (I’m a Prius owner.) The tour was fascinating. “Fireproof Ants”—What’s not to like about a title like that? “Molecular Origami”—I didn’t realize that protein molecules folded and unfolded, and if they don’t fold properly, they make us sick. Halim Dhanidina, Class of 1994, a judge in Long Beach, CA.—If I had to be in court, I’d want him for my judge. “The Meaning of Emptiness”—Added to my continuing education about Buddhism. Once again you have given us a splendid magazine. I’m thinking that most college magazines haven’t featured students wrestling with the religious practices with which they had grown up, trying to see if they fit with their college experience. So you’re breaking some new ground there. The photos accompanying those interviews are beautiful. On page 19, I glanced casually at the photo of Bryan Stevenson and then suddenly realized that I was in the middle of reading his book, Just Mercy, as an assignment for my church women’s class. If the magazine had arrived a month earlier, I wouldn’t have known who he was. What a heart and a mission that man has. At my 50th reunion we toured the two new dorms and I was charmed by the roof garden on one of them. The magazine shows the garden as a place for meditation (page 12) and as an opportunity to mentor local high school students (page 20). So, congratulations on another “work of art” in magazine publishing. But let me know if you find out what went wrong with my missing and duplicate pages. I always look forward to reading each issue of PCM. This last issue—summer 2016, “Keeping the Faith”—holds meaning for me. I thought it especially wonderful to see the Islamic student (Pomona ‘16) on the cover as well as to read what she has to say in the pages inside. I have always felt that all true religions are God-bearing in the light of human hearts. There is something else which spoke to me in particular—namely, her connection to nature. She writes of going up on top of Pomona Hall among birds and clouds. Much of my work as a poet (an Angelean lyric poet) is inseparable from nature-phenomena. So I am especially filled with gratitude for this issue.